American football offensive lineman who was a second round pick of the Cincinnati Bengals in 2006. He's spent most of his career playing left tackle for the Bengals. He was a two-time All-SEC selection at Louisiana State University, where he won the 2003 BCS national title. A standout athlete in high school, he was not only the sixth-best offensive line prospect in the country, he was also a champion tennis player and talented golfer. He has four children with his wife Melissa. 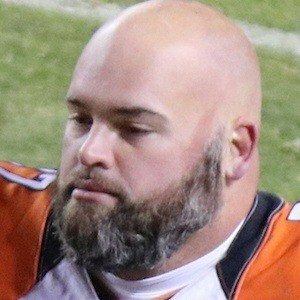 In 2010, he caught a touchdown pass from Carson Palmer, becoming the first Bengals offensive lineman to do so in 15 years.